You may have just purchased a Samsung Galaxy SIV and are just basking in joy of having the ultimate Android phone in your hands. 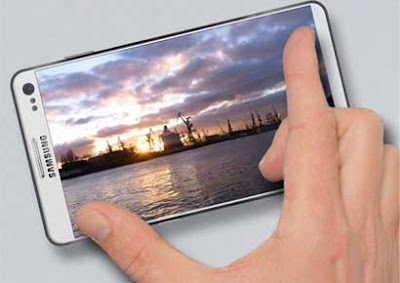 The flagship phone from the South Korean giant in your hands may be sense of envy among your friends and colleagues. But, do you know that the brand new Samsung Galaxy SIV comes with both wanted and unwanted features. 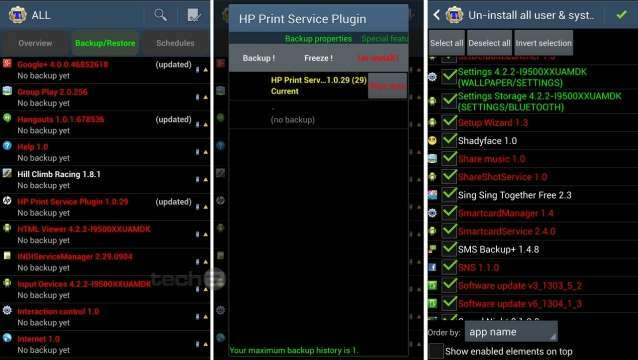 The Samsung SIV comes with a hell lot of bloatware (see screenshot)! You will sure be overwhelmed by the features on the Samsung Galaxy S4 combined with super good looks, do remember there are several unwanted Apps under the hood of the device which not only hog memory but also make your screen a bit cluttered. A few examples of unwanted Apps and features are the stock live wallpapers, such as phase beam and bubbles or the printing services which you may never use. Some features like maps, social networking apps, widgets, weather apps and a few more run in the background even though you will use your own custom Apps. While most might not be active every time you switch on your Galaxy S4, they unnecessarily hog useful space, and believe me if you own a SIV you will require every bit of real estate in future. And add to that they eat into the system resources and feast on the battery life. So it is better to get rid of them and make your phone lighter App wise, clutter free and in the process enhance the battery life. The beauty of using this tutorial is that you can safely delete the unwanted material and can even restore some of the Apps, should you require them in future. To continue with the tutorial you have to root the Samsung IV. Kindly read the tutorial for rooting Samsung Galaxy SIV i9500 here. If you have done so already, proceed with the tutorial. The method to get rid of the bloatware was put up by my friends at XDA forums a while ago and is pretty neat. They have also opened a separate SIV thread, should you need one, head over there. Now back to the tutorial. All you need is a rooted phone with a root-enabled file explorer to enter into the system area and delete the unwanted applications from there. It is requested to make a backup before you do so, just in case you accidentally delete something you didn't intend to. To reinstall any app, just copy the file into the original location and set permissions for Read/write, Read Read (RW-R-R) (see screenshot) and reboot the phone. Remember YOU are not to install these system Apps like any other Apps you download and install. This may cause your OS to crash. As I have already advised take a complete backup (Nandroid) using the recovery mode and then proceed. In case you mistakenly delete something important, you can simply recover the entire operating system from the Nandroid backup. You can also use the Titanium Backup for removing the unwanted files. You can either freeze the app or uninstall it. Titanium Backup also features automatic backup of the app you are uninstalling, so you are safe here too. To get the app back, you can simply defrost it or restore it using Titanium Backup. OF the two this is a safer method. The other Apps available for removing the bloatware such as "NoBloat" and "Root Uninstaller". Click on the hyperlink to download them. These apps can also back up and restore the apps at a later stage, but they won't free up any memory on your phone, they will hide the apps from your app drawer and keep them from running in the background or popping up notifications. After removing the bloatware PLEASE NOTE THE FOLLOWING : In order to keep the deleted apps from reinstalling automatically after rebooting, make sure you have deleted the app "PreloadIndtaller.apk" from the "/system/app" folder. If you forget to delete this app, the bloatware will reappear again after rebooting. If you have any queries like a system crash or other bad, you can head to XDA forums where the Android Guru's will solve your any query. Remember rooting voids warranty and is only to be done if you are comfortable with playing with system files. Do not, I repeat do not attempt it if you are a novice.